I was sitting in my rocker looking at pictures of our trip to Schlitterbahn Waterpark (more on that another day) when I heard this thunderous pounding. It couldn’t be, I told myself. The weather guy on the 5 o’clock news said showers had been popping up and viewers in a few areas, including Georgetown, might see some. But I didn’t really think it would happen. After more than a month without any rain, it seemed like the weather forecasters were putting a 10 percent chance in the forecast just to keep the viewers off their backs. But seems this time they were right. With the sun shining and the wind howling, we got a good 3 tenths of an inch. 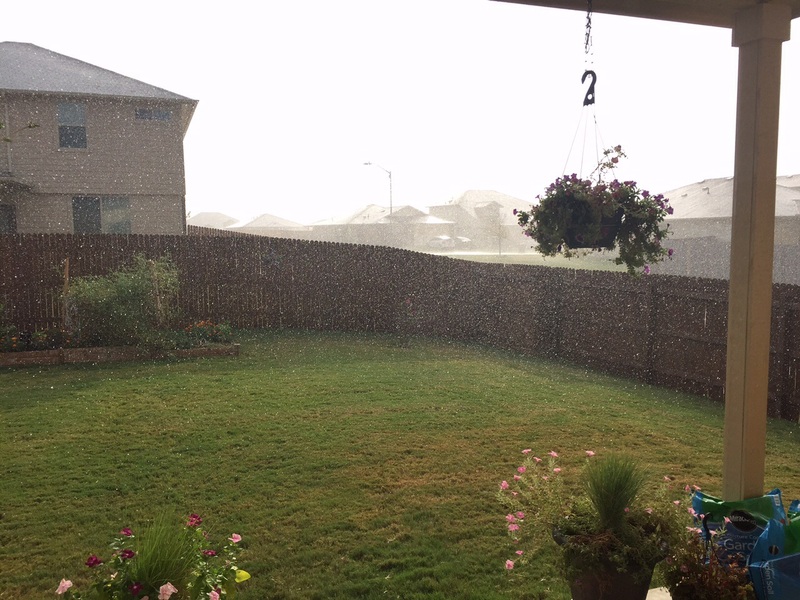 It was interesting to see the rain fall in such hot temperatures — it was 102 when it started raining. It turned everything into a giant sauna, with steam rising off the hot pavement. The raindrops were so huge it sounded like they might break the glass as they hit the windows. Fortunately that didn’t happen. The wind did take the neighbor’s trampoline and flip it up on top of the fence between the adjoining property. And just as I saw the trampoline, I watched my plastic watercans, garden shoes and a towel tumble across the back yard. I grabbed a raincoat and pulled them in, noticing at the same time that the decorations I had nailed up on the fence were on the ground, too. No worries there, they were all easy to tack back up. And no worries with the trampoline, either. Within 5 minutes after the storm blew through, the trampoline was back on solid ground and the neighbor girl was jumping on it. It was a short storm, lasting only 10-15 minutes, but we got a good three-tenths of an inch from it. 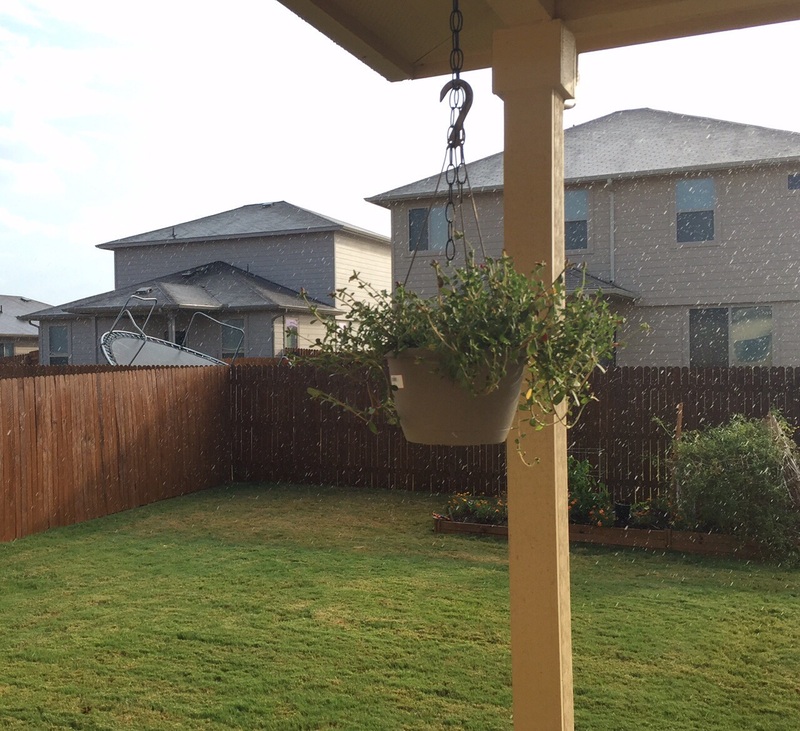 I realize that’s not much, but it is real rain from Mother Nature, and I know the plants, flowers and grass like it better than the stuff I give it. And it gives me hope that maybe it will rain more again in August. 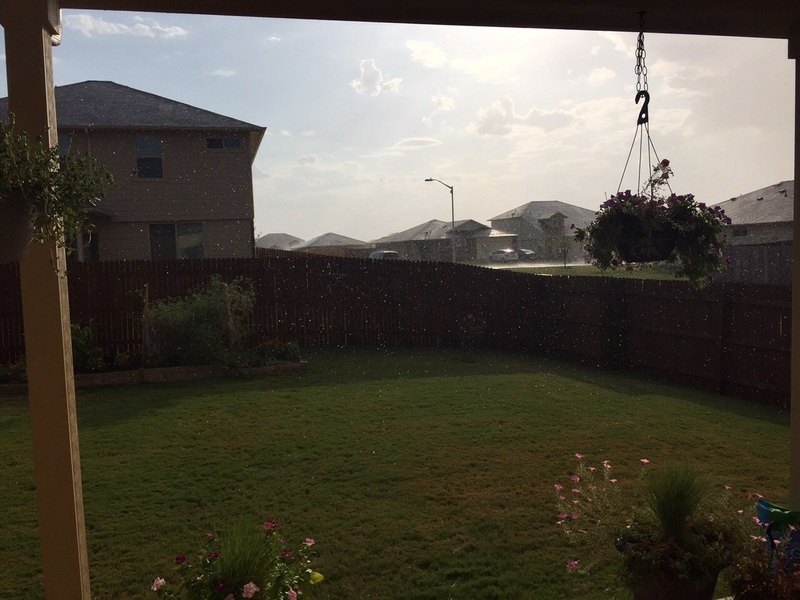 Love how the raindrops shine with the sun in the background. The gusty wind picked up the neighbor’s trampoline and flipped it over the fence (left).